The national “Grand Débat” has launched after French President Emmanuel Macron responded to questions from mayors for almost seven hours last night (Tuesday January 16). 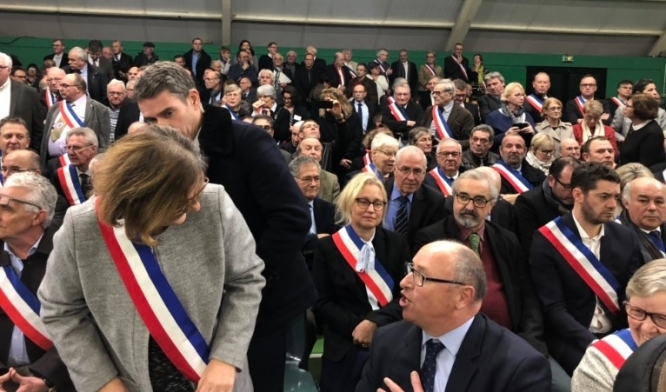 Almost 600 mayors from across France took part in the first debate yesterday, which took place in high security at a gymnasium in the commune of Grand Bourgtheroulde (Eure, Normandy). The main questions and concerns from local residents to President Macron centred on issues such as taxation, lack of buying power, isolation in rural areas, and the 80kph speed limit. Mr Macron replied to each point from the mayors, one by one. He promised an “Act 2 of [his] mandate” and wanted to “succeed in making a Republic that is always questioning and deliberating”. For the first time ever, Mr Macron used the words “gilets jaunes” to describe the events of the past two months, and said that the crisis was “a chance to react more strongly” and continue “deep reform”. Yet, the President defended many of his reforms, and cited economic figures to justify many of his plans, such as scrapping the wealth tax (ISF; l'impôt de solidarité sur la fortune). He also said that the unpopular 80kph speed limit change could be revoked, in agreement with his colleague Christophe Castaner, minister of the Interior, this week. The President also conceded that the responsibility for managing ID cards or cartes grises could be passed to mayors. Among the other suggestions brought, the mayors asked for a drop in VAT on necessary items, more devolution of power to local mayors, mandatory voting, and greater funding for public services, especially in rural areas. Another, Francis Courel, mayor of Saint-Philbert-sur-Risle (Eure), said the gilets jaunes protests had helped provoke a “waking up of democracy”. Around 100 gilets jaunes demonstrated outside the event, with some shouting the protest slogan “Macron Démission (Macron Out)”. Some protesters managed to breach barriers around the venue, with two men arrested after being hit with tear gas thrown by police. Among the wider public, confidence in the Grand Débat appears low. In a poll this week, 40% of French people say they intend to take part, but just 34% believe that the events will help bring France out of crisis.